The Monster Energy NASCAR Cup Series goes short-track night racing Saturday night with the running of the Toyota Owners 400 at Richmond (Va.) Raceway. Kyle Busch heads into the weekend as the most recent winner, claiming his third win of the season April 7 at Bristol (Tenn.) Motor Speedway. He also is the winner of the last two Cup Series races at Richmond, sweeping series racing at the track last year. 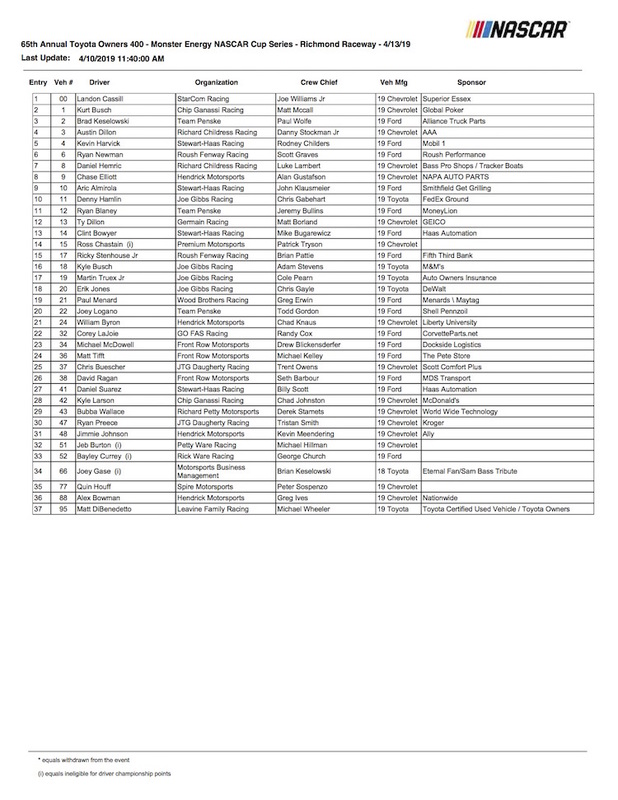 Thirty-seven drivers are on the entry list for Saturday night’s race. Qualifying for the Toyota Owners 400 is scheduled for 5:40 p.m. ET Friday and will be shown live on FOX Sports 1. The race is slated for an approximate 7:30 p.m. green flag Saturday and will air live on FOX.